The Cloisters was bequeathed to the City of Baltimore by its original owners, Sumner A. Parker (1881-1946) and G. Dudrea Parker (1883-1972). Both Mr. and Mrs. Parker were Baltimore natives and graduated from the Johns Hopkins University. After their marriage in 1905, the Parkers traveled throughout Europe and the United States collecting art works and artifacts which they kept at The Cloisters and in their home at 913 St. Paul Street. The Parkers frequently opened both homes as museums for the public. Mr. Parker was president of Armstrong and Parker Company. Located where Lake Clifton High School now stands, the company made ornamental ironwork, such as balconies and gates. Some of this ironwork can still be seen at The Cloisters and around the city. The Parkers had three children: Sumner A. Parker, Jr. (who died in infancy), F. Jameson Parker (1909-1971), and Katherine S. Parker (1914-1978). The Cloisters is located on a 60-acre estate in Brooklandville, Maryland. The Parkers designed The Cloisters themselves, basing their design on the late medieval French and English architecture they saw during their travels. 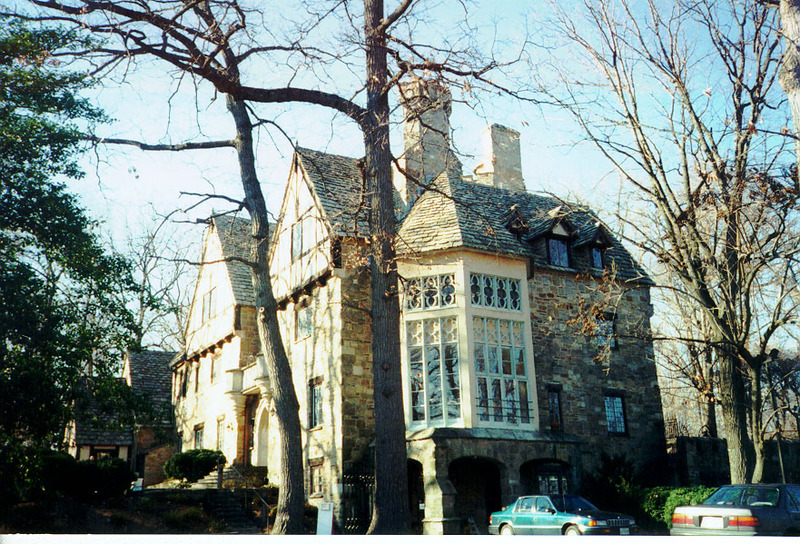 Construction took several years and the house was completed in 1932. The Cloisters takes its name from the cloistered, or covered, walkway enclosing the garden located next to the Gallery on the first floor. The Cloisters has a unique blend of architectural elements and design styles. The massive walls and stones of the roof are all of native Butler stone, some of which was quarried on the estate. The interior beams are of oak, walnut and chestnut, selected from trees grown on the estate and hand-hewn by Mr. Wylie Ingram, a woodworker and craftsman originally from North Carolina. Most of the decorative ironwork was designed by Mr. Parker and executed in his ironworks, including the railing of the four-story spiral stairtower. The carved stone doorways in the Gallery and the Chapel are Glen Ellen mansion, once located near the Loch Raven reservoir. The original estate windmill was a studio for Mr. Parker. After it burned in 1940, it was replaced by the one now standing. This served as quarters for the groundskeeper and pumped water for the swimming pool. The house is principally composed of large, random-sized blocks of grey and gold Butler stone quarried in Maryland. Some of the stone was quarried on the estate. The roof is made of heavy Butler stone flagstones arranged in an overlapping pattern and secured by iron pins. The stones are of irregular sizes, approximately one-inch thick and 8-12" across. This roof is the only one of its kind in America. The two projecting sections of the main facade are topped by massive, half-timbered gables, originally part of a medieval house in Donremy, France. The two pale grey circular medallions incorporated into the main facade are from a 16th century Venetian house. The cloistered garden, from which the house takes its name, is located at the north side. "Cloisters" is an architectural term used to define a covered walkway with an open colonnade on one side, usually enclosing a garden. The Entrance Hall has a Gothic-style ribbed, vaulted ceiling executed in plaster made to resemble stone. The floor is grey slate decorated with small inset grey marble medallions. The diamond-paned, iron casement windows are fitted with random circular panes of stained glass known as bull's eye glass. The enormous Gallery was designed to display the Parkers' paintings, furniture, and other art objects. The mantels of the fireplaces here and throughout the first floor are composed of chest sections decorated with carved designs, escpecially the linen-fold motif. The sides show carved wooden Renaissance figures as well as panels of ornate late medieval geometric motifs. The interiors of the fireplaces feature blue and white Delft tiles with craft and floral designs. The firebacks are ornate cast iron. The Chapel adjacent to the Gallery has plaster walls made to resemble stone blocks. The top of the windows are decorated with wooden Gothic tracery from the renowned Baltimore Gothic Revival mansion, Glen Ellen. The elaborate door leading to the cloistered garden is from a 16th century Veronese house and features an antique stained glass window. The floor is of random-sized Butler stone. The vertical molded panels between the bays of shelves in the Library conceal ladders to provide access to upper shelves. The Gothic-style stairway has an unusual rope ornament on the supporting archway. The beams in the Living Room are hand-hewn from chestnut trees grown on the estate. The doors to the Library, Entrance Hall, and the small closet are medieval French in origin. Each is decorated with a variation of the linen-fold motif, as are the panels below the windows. The fireplace is made of plaster shaped to resemble stone. The Dining Room features a late medieval wooden panel on the chimney breast over the mantel. The panel has five vertical sections with carved floral and animal figures and an oval medallion with an intricately carved coat-of-arms. The windows in the Solarium behind the Dining Room incorporate wooden Gothic tracery from Glen Ellen. Click here for a picture of the Cloisters.